I am back from my daughter's field trip after being gone several work days last week. It's time to get back into the swing of things! After Christmas decorations come down, I always use that opportunity to rearrange our accessories. It is so easy to get bored with what you have, but if you use items in different ways then it always feels new and fresh…at least to me it does! Here are a couple of photos of my hubby's clean slate mantle. I knew that I still wanted to use the antique mantle clock and my Tuesday Morning faux boxwood topiaries so I positioned those first. Then I started playing around. I have always used his mortar and pestle collection on the built-ins, but I liked how they looked on the mantle at Christmas. You can find his Christmas Mantle here. 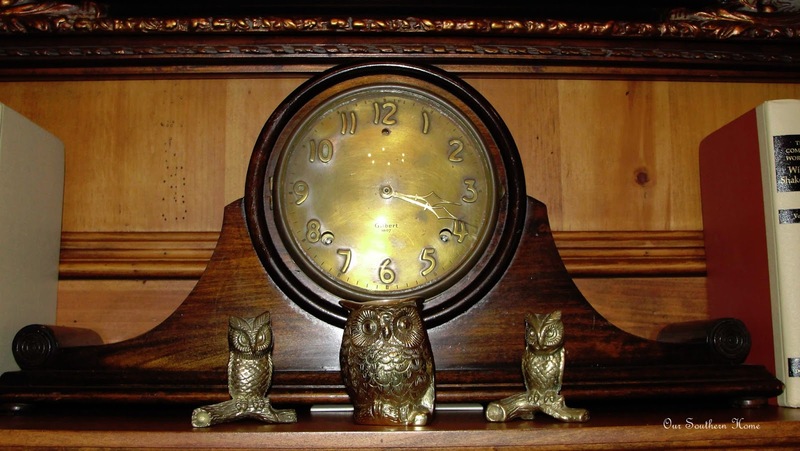 I then took a few other items from the built-ins to use……my mother-in-law's vintage brass owls and old books. Here is the after. I am sure it will find many changes throughout the year, especially with my antiquing and thrifting. Here are a few closer ups of the accessories. 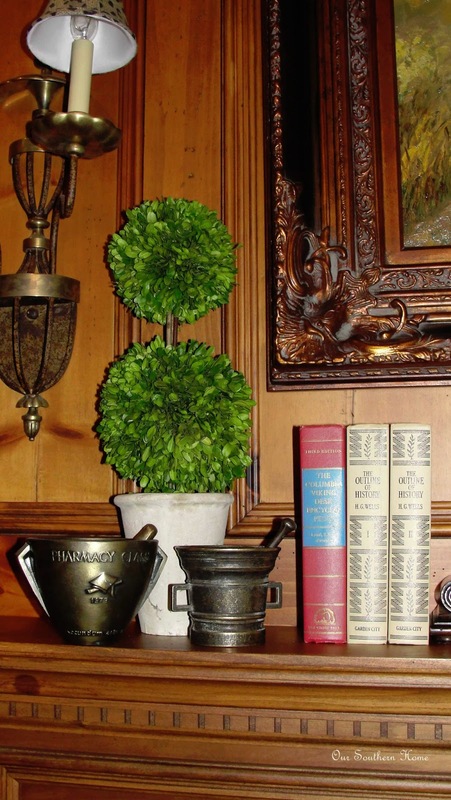 I am really happy with how the antiqued brass and vintage look colors stand out against the distressed pine paneling. I am so excited!!! 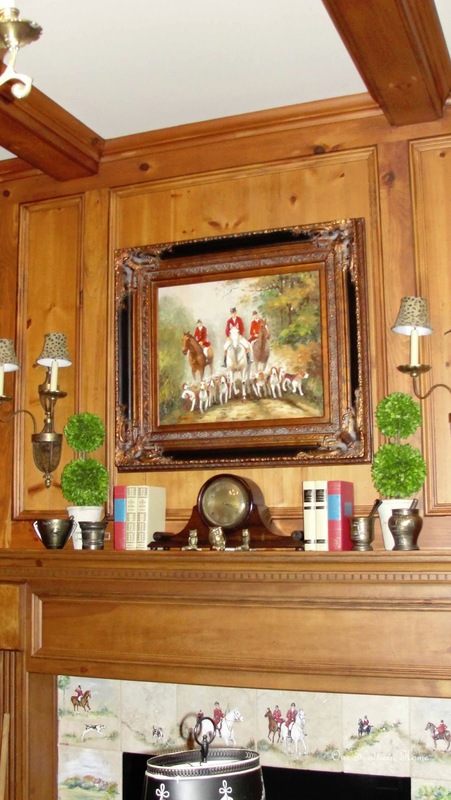 I have been looking for artwork for a very long time to hang on either side of the fireplace in the long narrow panels. I finally found the perfect pieces from One Kings Lane!!! Of course, I have purchased them for my hubby for Father's Day. I have plans between now and then to have them framed! Each came as a set of two. I plan to stack them on top of each other with 2 on either side of the fireplace. Each reproduction print is 14×17 inches. A pair of 2 was on sale for $99. According to the original price, I saved $592!! 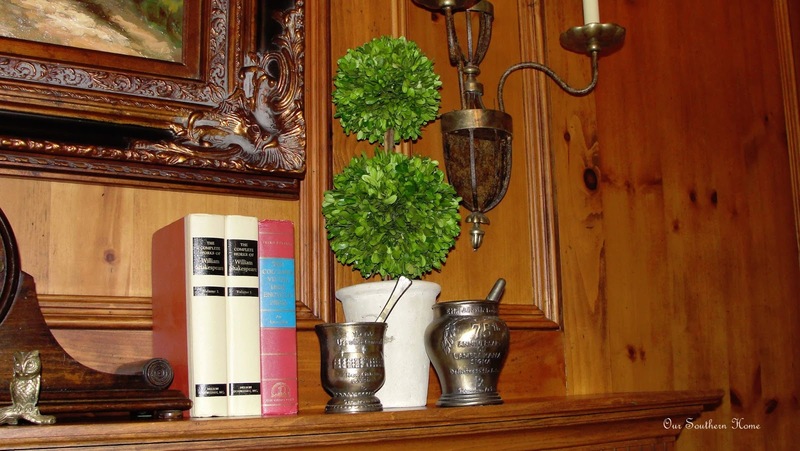 They are perfect for his study and the style of our home! I can't wait to have these hanging. Come on JUNE!!!! As soon as they come in, I'll be sure to share them with you. I'd like to thank all of you that commented on my troubles with completing blog posts with Internet Explorer in Blogger. I tried Google Chrome as many of you recommended! I have been having issues since I started blogging in September. This is the FIRST time that things have run effortlessly. I can't tell you how thrilled I am! Before it may let me resize 1 picture to make it larger. This is the first post where all of my pics are the same size! It is Google Chrome from now on!!! Wooo hoooo! Can you tell that it doesn't take much to make me happy! Thanks so much for being here! I'd like to welcome all of my new followers of Our Southern Home and thank the ones that have been here along the way! I am so blessed to have you here. It has been such fun getting to know you! « I will be away for a few days…..
Hi Christy. I found you through No Minimalist Here. Your home is beautiful and this study is stunning! We don’t live too awfully far from one another – I’m in Greensboro, NC. I’m planning to attend Haven this year too so hopefully I’ll see you there! Suzy, thanks so much! We were recently in Greensboro on our way to Chappel Hill. We stopped to visit nephew’s new baby. They live in a downtown area with lots of younger families and restored homes. I wish we had had time to hang around since we passed by so many wonderful looking thrift and consignment shops! I can’t wait to meet this summer!!! found you through your feature at No Minimalist Here Party. 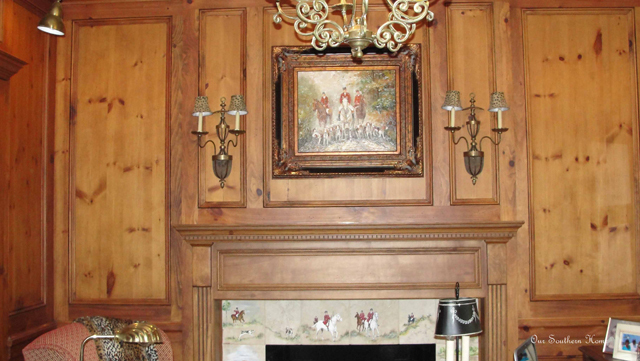 Your fireplace wall is gorgeous, love the pine and the equestrian tiles on the fireplace. It looks lovely the way you have it styled, looking forward to seeing it with those great prints added. I’m your newest follower and would love for you to visit me. Thanks so much, Rebecca!!!!! I can’t wait to visit your blog! Thanks so much Sherry!!!! I am so excited!!! ps: I am a new follower! Sherry, thank you so much!!!! I love your blog! Just beautiful! I’m going to feature this at Grace at Home this week–thank you for linking it up! Wow!!! Thanks so much Richella. I can’t wait to check it out! Thanks so much Kathy! It is always such a fun party! So pretty! I would love to have you join me on The Creative HomeAcre Hop today! Thanks so much, Lynn! I just joined your party!!! 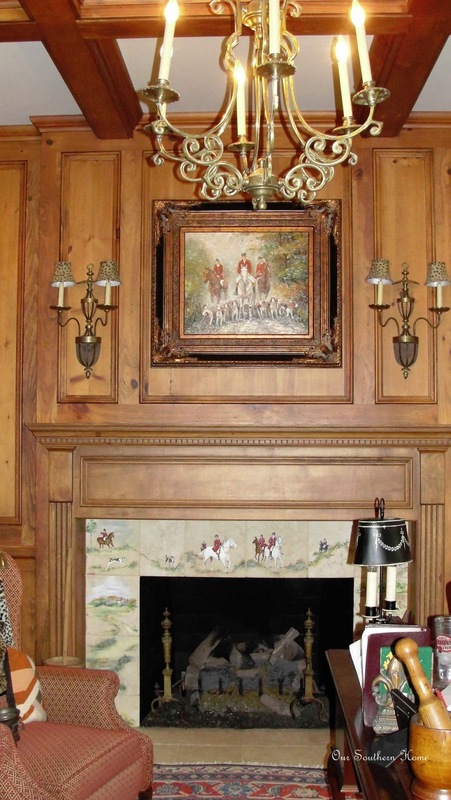 Christy, Love your beautiful mantel. The treasures you found to display, are perfect! Can’t wait to see the prints framed. Thank you for sharing at Simple & Sweet Fridays. Thanks, Jody! Your party is always such a treat! Your husband’s study is beautiful, I am trying hard not to covet that paneling! 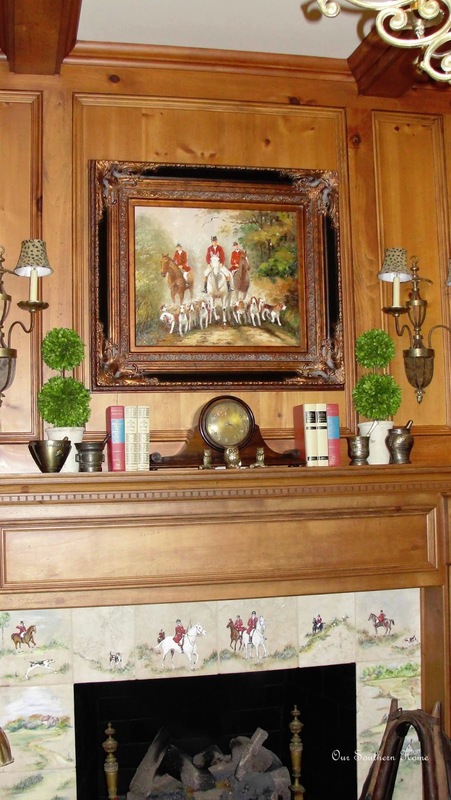 I think you have done a great job on the mantel, combining his interests with your treasures. Thanks, Sue!! This will always be the room that never needs repainting! LOL! We have been so happy with the paneling! So pretty. Glad I came by for Wow us Wednesday. 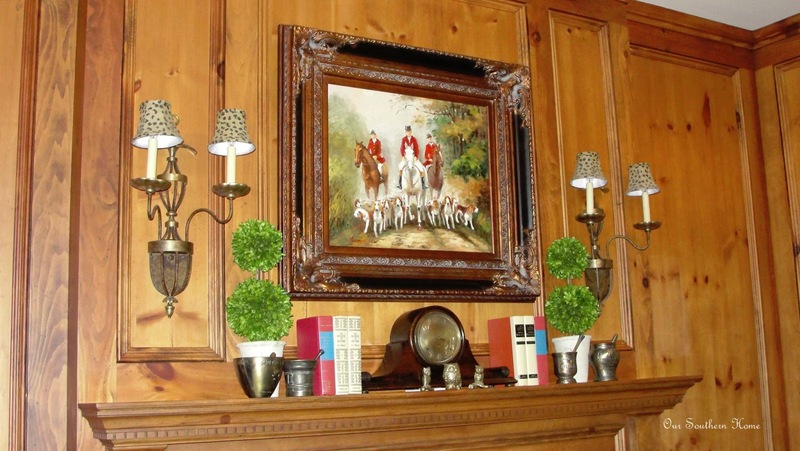 Christy, this is my first time stopping by [via Savvy Southern Style] and wow, I LOVE your mantle and the hunt scene painted on the surround. Is there a blog about that? Ang, thanks so much for stopping by!!! We built our house almost 8 years ago. We have horses. We had a local ceramics artist that was painting a French scene above our range in the kitchen. We loved how it was turning out so we had her do the hunt scene for the fireplace. I have had so many compliments on it. I do need to do a blog post just on it. The scene starts on one side and goes all around the fireplace. Thanks for visiting!!! Thanks so much, Robin! I am visiting now!!! My daughter plays tennis! Your mantel is gorgeous. The tiles around the fireplace are beautiful as well. Thanks so much Mary Alice! Happy to have you here!!! What a beautiful mantle! The wood is so pretty. Love every detail! I am your new follower! Thanks so very much Maria! I am so happy you are following!!! 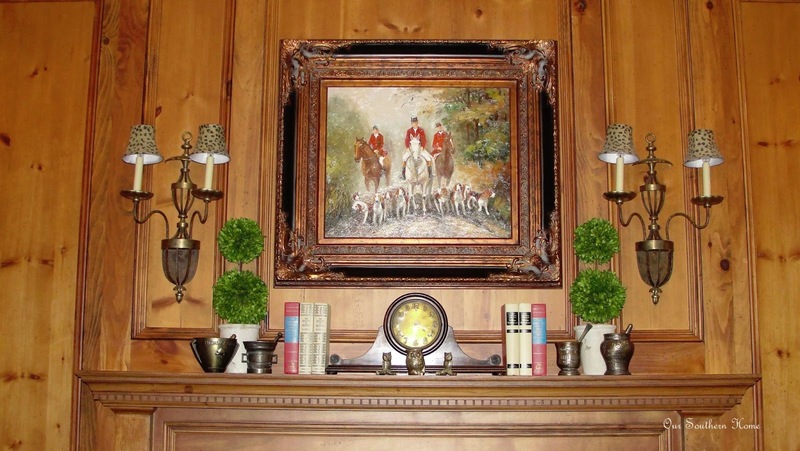 Looking at your mantel, I feel I’ve been transported to an English manor house. How lovely! Thanks Maureen!!!!! I am so blessed that you visited! What an awesome deal on those beautiful prints. Thanks for sharing at my party. Thanks so much Linda. I am really looking forward to getting that room finished! The mantel is beautiful, Christy! I love the rich color of the paneled wall and the tile surround is a perfect fit. Thanks Carol. I appreciate you stopping by!!! Your mantel is so lovely! Your room looks lovely! I have a clock like yours. Thanks sweet Shelia!!! 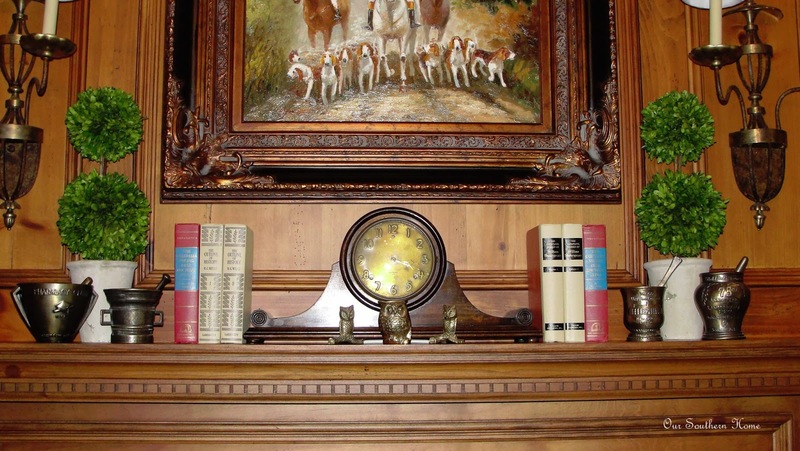 We have enjoyed our mantle clock as I am sure you have! Love this room Christy! The rich wood tones are just so warm and cozy! Your vignette looks wonderful and congrats on such a great deal on your prints. Can’t wait to see them all framed up! Thanks Cindy! I am excited about getting those prints hung and being a bit closer to a completed room! What a beautiful room Christy! The wood is just gorgeous! I think those new art prints are going to look fabulous in there on those panels. 🙂 June is a long way away though!! 😉 lol I’m not sure I could wait!!!! Thanks, Nancy! Yes June is a very long time away!!! Luckily they aren’t due to ship until March. I think I can….!!!!! Thanks sweet Diana! You know me too well. I wonder how long I can wait! LOL! What a gorgeous room and mantel!! Love the prints Christy, can’t wait to see them framed! Thanks so much, Martina! I hope I can wait until June!!! I love all the wood Christy! Can’t wait to see the art framed! Thanks, Sonya! I hope I can wait until Father’s Day!!! 🙂 Great seeing you at the convention last week even if we didn’t get a lot of chat time!